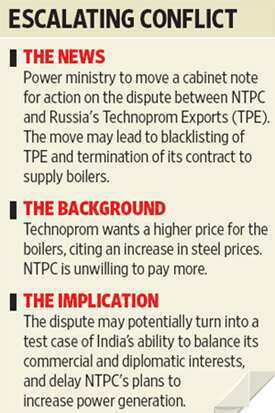 New Delhi: The Union power ministry has decided to escalate its battle with Technoprom Exports (TPE) by taking the dispute with the Russian firm to the cabinet in a move that could lead to its blacklisting and termination of its contract to supply boilers to NTPC Ltd’s 1,980MW Barh power project in Bihar. The power ministry is preparing a cabinet note for the government to take a final decision that could see tough action taken against TPE, already under investigation for payoffs it allegedly made to secure the boiler order. TPE won the contract in February 2005. Work on the project stalled after a contractual dispute arose between NTPC and TPE, with the Russian firm demanding more money, citing higher steel prices. While the contract value was around Rs2,066 crore, TPE is demanding an additional Rs1,700 crore, which NTPC is unwilling to pay. “It is basically a political decision. We will be moving a cabinet note on the subject shortly," said a top power ministry official, who did not want to be identified because of the sensitive nature of the matter. “The issue is beyond economics. They should be blacklisted and the contract (should) be terminated," the official said. “The Russians are putting pressure at the top," he said, likening the row to a dispute over the purchase price of Admiral Gorshkov, the aircraft carrier. Russia has been demanding an additional $2 billion (Rs9,780 crore) for the warship after signing an agreement with India in 2004 to sell the refitted aircraft carrier, along with 28 MiG-29K fighter jets and other components, in a $1.5 billion deal. “The matter is being taken to the cabinet. We are informing them about the whole situation. Since the matter involves Russia, we are looking at all possible implications, including the diplomatic ones," said a top NTPC executive, who did not want to be identified. Mint reported on 24 November that the Russian government was holding up India’s request for a stake in the Sakhalin-3 crude oil fields until the dispute over the boiler deal was resolved. Russia’s stand was spelt out by Prime Minister Vladimir Putin during petroleum minister Murli Deora’s visit to Russia early that month. In an emailed statement, the embassy’s media and culture attache said, “...your interpretation of the situation...is not correct." TPE is one of the world’s leading companies in the construction of power projects and the Russian government protects its interests because it is a state-owned company, the statement said. “International economic relations today implicate that different countries protect interests of their state and private companies abroad and the Russian Federation is not (an) exclusion. It is a part of the world practice," added the statement. “And of course, assisting and protecting interests of Russian national companies abroad cannot be interpreted as exerting pressure on the Indian government." Questions emailed to TPE’s office in Russia on 2 September remained unanswered. There was no response to queries sent to TPE’s India representative. “Necessary steps are being taken to resolve the dispute," said an Indian government official with knowledge of the matter, who didn’t want to be identified. “TPE is a state-owned enterprise and any government has the right to protect its interests." 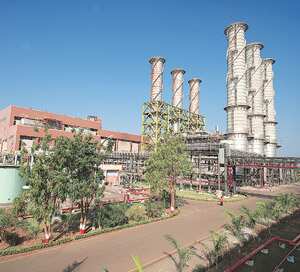 Analysts believe that it will be difficult for NTPC to pursue its case on merit alone, given the implications for India’s diplomatic relations with a close ally. “Even if NTPC is technically on the right position, this is a diplomatic issue with a key ally of India, and has to be settled accordingly. It is very difficult to foresee a situation where the government of India can take a decision purely on (the) merits of NTPC’s case," said Anish De, chief executive at Mercados Asia, an energy consulting firm. NTPC is India’s largest power generation company with a capacity of 30,644MW. The delay in the Barh project could affect its plans to raise its generating capacity to 50,000MW by 2012.